Five of the jailed Catalan pro-independence leaders have requested a delay in the beginning of their trial, currently set for 12 February. The Supreme Court announced the date on 1 February, with 11 days notice, something the defendants think is not long enough. The lawyers of Oriol Junqueras, Raül Romeva, Jordi Turull, Josep Rull and Jordi Sànchez have demanded that the trial be delayed for three weeks, on the grounds that they need more time to study the evidence admitted by the judge. The Supreme Court only revealed what evidence and witnesses they would admit on Friday. 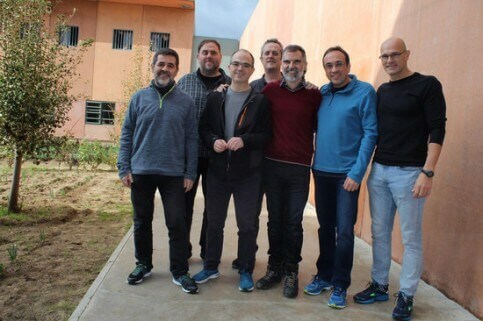 The defense teams also complain about the jailed leaders being in Madrid prisons for four days but without so far being given computers to prepare for the trial. For Rull, Turull and Sànchez’s lawyers, this is ‘an obvious and effective violation of their right to a defense and their fundamental right to equality before the law’. The nine jailed pro-independence leaders were transferred from prisons in Catalonia to penitentiaries in Madrid on Friday in preparation for the trial. Rull, Turull and Sànchez also denounced ‘humiliations’ during their transfer, referring to a video of a Spanish police officer mocking pro-independence supporters. The Catalan parliament speaker, Roger Torrent, visited the leaders on Monday and said they have no heating in their cells, which he called ‘extreme conditions’. Torrent also denounced the fact that the officials have had yellow clothes and other yellow objects confiscated, as well as issues of the satirical magazine El Jueves. In the past year, yellow has been the color used by supporters to demand the release of the leaders, with the symbolic colour leading to a number of controversies. ‘When it reaches the point of a sickly obsession trying to ban a colour, it is a problem for all democrats, not only pro-independence supporters,’ said Torrent. He is due to visit the female leaders incarcerated at the Alcalá-Meco prison on Tuesday.